Mosaic Clubhouse supports people who are living with a mental health condition. Mosaic’s approach is built on the internationally-recognised Clubhouse model , which embeds coproduction between staff and members throughout all activities. We are intentionally understaffed so when you join Mosaic Clubhouse you will be taking part in the running of the organisation. We aim to promote positive mental health for those living with severe and often enduring mental health conditions, enabling individuals to regain the confidence and skills necessary to lead productive and satisfying lives. Members have the opportunity to work on reception, run our café, maintain our gardens, support our administration and finance activities and deliver workshops for the benefit of their peers. Members are therefore the key stakeholders within our organisation and participate in all our work, decision-making and governance opportunities. What happens when I join Mosaic Clubhouse? On first joining Mosaic, you will join a 12 week programme, during which you will work with an individual Support Worker to help you identify and achieve your goals. The approach will be holistic, looking at all areas of your life and connecting you with other support organisations within the Living Well Partnership or further afield where appropriate. Business & Administration , Cafe & Maintenance , Employment, Education and Information . You will also have access to our social & wellbeing programme , and a variety of employment & education opportunities, information & signposting service s and the Evening Sanctuary . We also have a young adults programme aimed at individuals aged 16-30. At the end of the 12 week period progress will be reviewed and on-going support provided to those who need it. Become a member of Mosaic Clubhouse. This Unit is the engine room of Mosaic Clubhouse. As well as routine, day-to-day tasks such as producing minutes, agendas, and reports, the unit manages our website and social networking activities; manages the organisation’s database to deliver statistical information to funders and commissioners, runs the reception, and provides tours. This is an excellent unit to work in if you’re keen on clerical work, want to develop your computer skills, or if you ultimately want to work in an office with a fun and vibrant team. 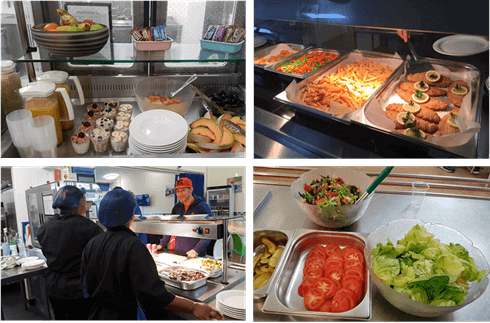 This unit provides one-to-one and group support for members who want to work in a service industry-style setting, running a busy, fully operational café each day which provides snacks and refreshments as well as a home-cooked two-course lunch. It is also responsible for the upkeep and maintenance of the Clubhouse and its gardens. The unit work includes the preparation and cooking of the day’s main meal with three main options, a meat option as well as vegetarian and vegan dishes. It also includes the preparation of snacks throughout the day. Members who have a favourite meal are invited to cook or run workshops teaching other members their skills. The unit work includes compiling and publishing Mosaic Clubhouse’s regular newsletter, ‘In the Mo’, as well as preparing our monthly e-newsletter, updating the news section of our website and creating eye-catching posts for our company page on Linkedin. The Information Hub is part of the E,E&IUnit and this engages members in providing tours of the Clubhouse, helping people with enquiries, filling out the database and researching opportunities to which we can refer people. At Mosaic Clubhouse we aim to improve our members’ mental and physical wellbeing through wellbeing initiatives, sport and physical activities . You can find our more information here .